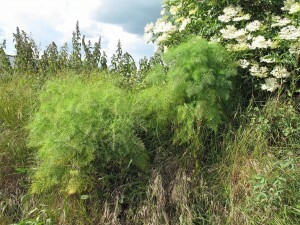 You may often see the tall feathery stems of Fennel in hedgerows. It does seem to like growing near the sea as I have seen it quite often near the beach as well as growing wild inland on our country walks. If you crush the leaves they give off a warm aniseed smell. Both the leaf and seed are used medicinally. It contains coumarins, volatile oils and flavonoids. 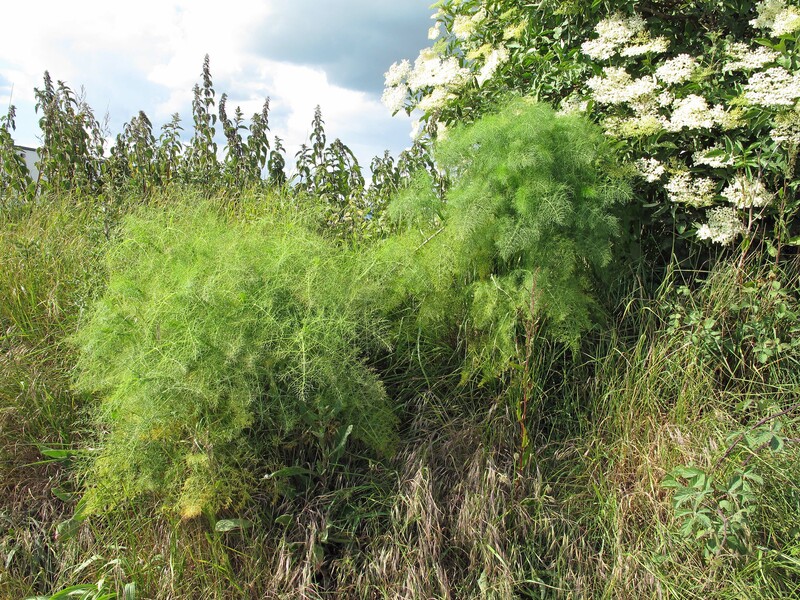 By now you will be getting the picture that anything with volatile oils has antibacterial properties, but fennel’s main action is as a “carminative”. This means it calms stomach cramping due to its antispasmodic properties, therefore settling and soothing any discomfort in the digestive tract, as well as dispersing wind by breaking it up into small pockets so that it can be eliminated easily. I use it in a mix with chamomile as an anti colic mix for babies and it is, in fact, in some proprietary anti colic mixes you can buy over the counter. Fennel tea made from the seeds is a wonderful digestive calmer and “soonf” (fennel seeds) are often handed around after an Indian meal sometimes coated in sugar like sugared almonds…..very nice to chew after a heavy Indian meal and will help aid digestion. I’ve just read that it smoothes wrinkles when drunk as a tea! I’m definitely going to give that a go! Sadly, I’m allergic to Fennel oil which is extracted from the seeds as it is a most wonderful smelling oil. Fennel seeds were found amongst the royal grave goods of ancient Egypt, so obviously has a long history of usage. I use it for imbalances in the female reproductive system such as PMT and find it especially useful for period pains, especially when mixed with Cramp Bark, which is a muscle relaxant. Cramp Bark, is discussed seperately in the West Rise Marsh walk and on the web site. Pulsatilla is also an herb I very often put into a mix to help people relax and get to sleep. When I first started to practice, with a case of facial acne which was proving difficult to clear up, so I phoned my mentor at the time who advised me to use Pulsatilla as it has skin cleansing properties. Well it certainly made the difference and I now rarely leave it out of any skin mixture. I use it in tincture formwhich you will be able to buy from any good herb supplier. I will not advise any dosage here as strengths of tincture varies, so follow the instructions on the bottle. You will also find it in tablet form and again please follow the instructions. Do not confuse it with the Homeopathic Pulsatilla preparation which has completely different actions. As usual, if you have any other medical conditions or are pregnant, please see a qualified Medical herbalist or your Doctor. The give away is the name of this plant! It is used as an antispasmodic, relaxing the muscles all over the body and can be used to relieve cramps of all kinds including period pains. It is a bushy tree, a native of North America but I see it growing commonly in English parks where it has been planted for its spectacular white flowers in the spring and gorgeous red berries in autumn. As the name suggests it is the bark of the plant which is used and this contains the very potent antispasmodic, viopudial as well as salicin which is an aspirin like compound, effective as an herbal analgesic and painkiller. I regularly use it in my herbal tinctures to relax muscles in conditions such as arthritis and period pains as well as putting it in an anti-inflammatory cream that I make up which I call for want of imagination aches and pains cream!